It’s great when I hear from women in the business/entrepreneurial world that resonate with my message. Learn Savvy’s Jen Aubert was one of those women who “get it” and I was thrilled when she invited me as guest on the new Learn Savvy podcast, where we spoke about the dormant power that lies in every woman, which I speak about in my book, Leading Gracefully. Having accessed my own “dormant power” many years ago while climbing a 40 foot tree and subsequently jumping out of said tree (while harnessed, of course! ), I realized that this is a unique gift that women possess, yet many are either unaware of it or don’t tap into it as much as they could be. This power lies in our second chakra, and is where our creativity and sexuality resides. It’s where life is created, but it’s also an immense source of power for women. But because of all the body shaming, objectification, and pressure to conform, our relationship with this part of our bodies is usually one that brings up a lot of shame, pain or even embarrassment. Rarely do we view it as a source of great creativity or power that we can utilize to our advantage. And yet tapping into it myself, I realized that when we do, we are much more tuned into the bigger picture, and we’re able to be strong, confident, and creative as a result. 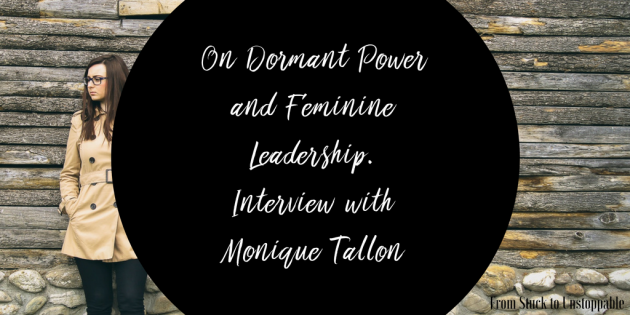 So that’s the topic du jour in my lively conversation with the lovely fierce and feminine Jen Aubert as we explored what it means to be a feminine leader in today’s world.